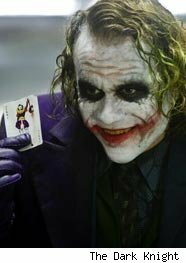 When it comes to comic book movies, for every Heath Ledger as the Joker, you've got 10 Arnold Schwarzeneggers as Mr. Freeze. For some reason, in spite of the fact that they're getting paid millions of dollars, some actors have trouble taking the ability to light your skull on fire or control the weather seriously. That's why, in honor of Bam! Kapow's list of the 10 Best Performances by Actors in Superhero Movies, we've decided to offer you Asylum's Three Worst Performances by Actors in Comic Book Movies. -- Ben Affleck as Daredevil. When you're playing a disabled character and no one has sympathy for you, you're in trouble. -- Anyone in "Ghost Rider." Hard to imagine you could fail with such gold from which to work, but they did ... miserably. -- Rosemary Harris as Aunt May in "Spider-Man." We refuse to believe this woman could be an aunt.